ABR's original Netlink audiobook review and many others can be found at Audiobook Reviewer. Twenty years have passed since the rebellion victory, and a reluctant peace agreement between the Imperial government and independent planets. The Imperium has developed a device that may now end all that; eventually crushing the rebellion and its independent allies once and for all. Word of this new technology has leaked, and a small band of rebellion spies must risk causing a war and losing their own lives to keep hope of their independence alive. 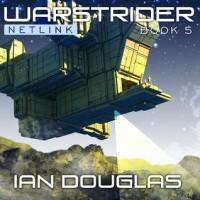 Netlink is a departure in many respects from the previous four novels in the Warstrider series. The DalRiss and the Naga have joined peacefully with the independent planets, changing their very culture in the process. Douglas’s imagination shines through here, bringing fresh and interesting ideas about alien interaction with humans. Racism is a dominant theme in this novel, Japanese vs. occidental, human vs. alien, and even alien vs. alien. This is not new in the Warstrider series, just brought to the forefront and with deeper implications. Two decades have passed in this novel, so you will see many new characters, but also older ones, though more as supporting rolls. The action moves along well and there is plenty of violence to entertain even the most blood thirsty space-war junky. The galaxy has just gotten a lot smaller as a new threat emerges from the core, something so alien, even the DalRiss and Naga cannot comprehend it. Humanity will have to put aside its own petty struggles with itself and its new alien friends to fight an even stranger and dangerous foe. David Drummond reads Netlink as he did in the previous four, with his clear and enjoyable baritone. Simply put, Drummond is the voice of the Warstrider series. Assuming you’ve read the first four books in the Warstrider series (if not, please start at book 1), and enjoyed them so far, you should definitely continue on. While Netlink is different, it is clearly part of the whole, and perhaps the most self-contained book of the series to date. You wouldn’t necessarily read it without first reading the others, but it might stand alone if you hadn’t. It, like the preceding books, it wraps up nicely.